John Taylor loved to sing. 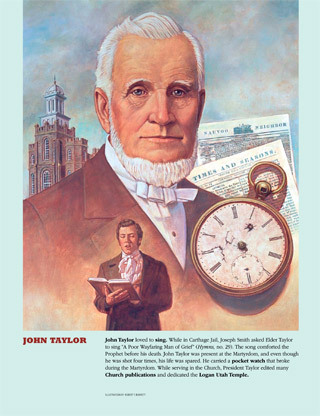 While in Carthage Jail, Joseph Smith asked Elder Taylor to sing “A Poor Wayfaring Man of Grief” (Hymns, no. 29). The song comforted the Prophet before his death. John Taylor was present at the Martyrdom, and even though he was shot four times, his life was spared. He carried a pocket watch that broke during the Martyrdom. While serving in the Church, President Taylor edited many Church publications and dedicated the Logan Utah Temple.